On Wednesday, August 23, the Baker-Polito Administration granted seven $65,000 grants to Massachusetts-based researchers and early-stage start-up companies to finance prototypes and proof-of-concept research in the clean energy and water innovation sectors. These grants were made through MassCEC’s the Catalyst Program – a biannual program managed by the Massachusetts Technology Transfer Center (MTTC) and funded by MassCEC that provides funding to researchers to further test the feasibility of their technology. Since the program’s inception in 2010 MassCEC has received nearly 500 applications, awarded roughly $3.65M, and has granted funds to 80+ research teams. Leveraging the $3.65 million, Catalyst alumni have gone on to raise an impressive $150M+ in total financing. Awardees come from all corners the Commonwealth and are researching a myriad of different technologies, like Cambridge-based Infinite Cooling’s water evaporation loss reducing technology. The technology reduces water consumption by power plants and saves them millions of dollars per year through its process of capturing escaping steam from cooling towers and reintroducing the resulting water into the cooling system. Since the program’s inception in 2010, MassCEC has received nearly 500 applications, awarded roughly $3.65M, and has granted funds to 80+ research teams. Leveraging the $3.65M, Catalyst alumni have gone on to raise an impressive $150M+ in total financing. Bevi is an example of one of the many success stories to come from the Catalyst program. Bevi offersa smart water cooler designed for office spaces that dispenses both pure water and flavored water, with both sparkling and still options available. Bevi’s technology eliminates the use of bottled water in offices which in turn reduces the energy consumption associated with producing bottled drinks and shipping the final product. 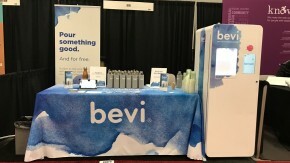 Bevi’s technology has reduced energy consumption related to the bottled drink industry by over 80% and has saved over 10 million plastic water bottles since receiving Catalyst funding. Since receiving a Catalyst award in 2013, Bevi now has over more than 1,000 machines in use, including systems in offices of companies like Netflix, Lyft, and General Electric. If the Catalyst program sounds like a fit for your start-up or research team, we encourage you to apply for this round, starting which kicked off on Monday, September 11. If you want to stay informed on the Catalyst program and everything else MassCEC has to offer startups in the Commonwealth, sign up for our Start Up Newsletter.